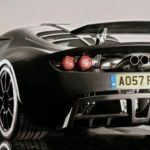 You could say that doing something like stuffing a big, fire-breathing V8 into the middle of a Lotus Elise is a bad idea. That it would upset the sublime balance of this damn near perfect car. I might be one to say that, given my love of the Elise, and of balanced sportscars. Then again, who am I to argue? This (taking a British chassis and stuffing in an American V8) was a formula that worked wonders for Carroll Shelby, and who’s to say that it won’t work here. “This is not the first time that Britain and America have joined forces to produce a weapon of mass propulsion. Over fifty years ago the American-built P-51 Mustang fighter aircraft was flown into history powered by a British Rolls-Royce Merlin engine. 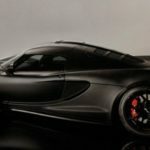 Today the Hennessey Venom GT promises to set a new standard of power to weight ratio in the rarefied air of today’s supercar market”, said company founder and president, John Hennessey. 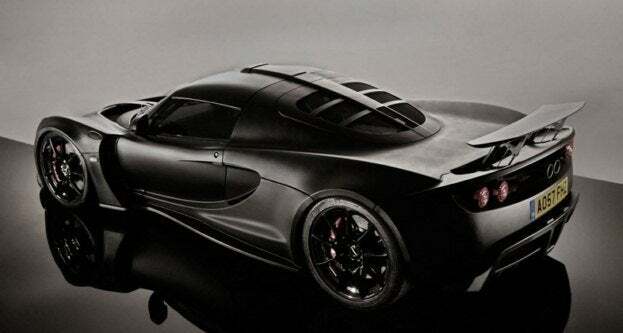 The Venom GT will have a production curb weight of less than 2,400 lbs (1,071 kilos). Yes, that is a lot more than the flyweight Elise, but 2400 pounds, about what a new Miata weighs, is pretty damn light. Especially when you consider the power this thing has. 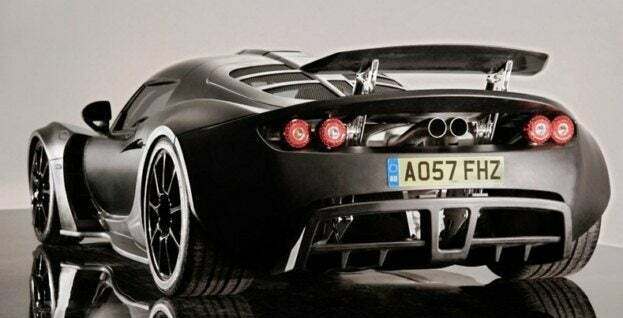 The light weight is aided by carbon fiber bodywork and carbon fiber wheels. Whoaing the whole deal up are Brembo brakes with 6-piston calipers up front and 4-piston calipers in rear clamping down on 15-inch carbon ceramic rotors. 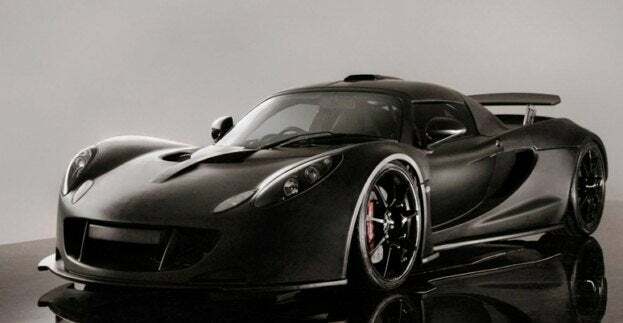 And speaking of ‘the power this thing has’, the short story is like this: The Venom GT’s base power plant is the supercharged 6.2 liter LS9 V8 (the same as in the Corvette ZR1) tweaked by Hennessey to 725 bhp. Note that is the BASE model mill you can order up. 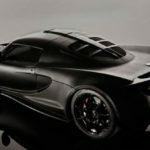 If you want (or are rich and suicidal) Hennessey will also be offering 1000 bhp and 1200 bhp twin turbo V8 engine variants. The mid-engine V8 plant will transmit its power to the rear tires via a Ricardo 6-speed gearbox, and thence, onto the tarmac via massive Michelin PS2 tires. So, 700+ to 1200 BHP in a 2400 pound car the size of a microwave oven. Controllable? It will be, because Hennessey plans to manage power output by using a programmable traction control system. 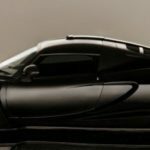 CFD (computational fluid dynamic) tested bodywork and down force will also help keep the Venom stable at speed, although no mention is made of just what those speeds might be … I mean, c’mon, do the math. There is also an active aero system with adjustable rear wing that will deploy under varying conditions. There is also an adjustable suspension system will allow ride height adjustments according to speed and driving conditions. 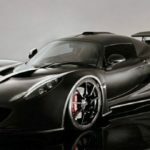 Hennessey will be building the engines at their Texas facility, and from there the engines will be air freighted to the company’s assembly facility near Silverstone, England where the Venom GT is built and tested. 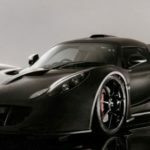 The lucky Venom GT buyer will be offered a 1-day driver orientation and instruction program by a Hennessey factory test driver, at a track in the UK or USA prior to delivery. Well, at least they have some sense of responsibility. 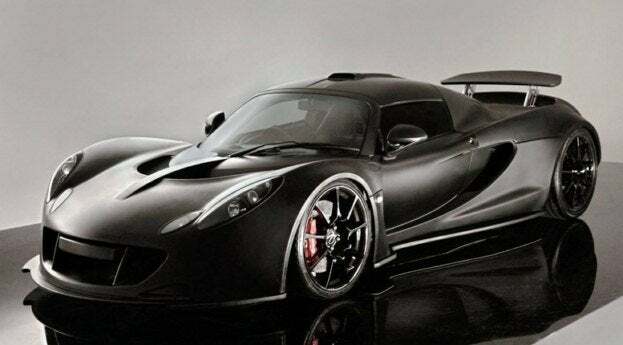 No Comments on "Hennessey Venom GT"